I just purchased a CPO vehicle from East Bay BMW and can't say enough about the positive experience I had. My salesperson, Patricia Fasick, was extremely knowledgeable, very helpful and a pleasure to work with. The Finance Department personnel were also extremely helpful. 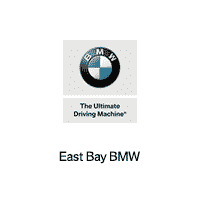 I would definitely do business with them again and highly recommend East Bay BMW for your next lease or purchase. Really good service from Jaime Abrego. He helped us out a lot and even stay after work hours to make sure we were taking care of. We love our Toyota Highlander. Great service. Excellent customer service Nice and clean sales area Many parking space Sales representative are very pleased and nice . Kelvin the finance manager help me to get what I need. He is the best. Bob Shankle really did his best to ensure that I was completely satisfied. Thank you! Wonderful sales and service team at East Bay BMW. Chris Lee, Spencer, and Kelvin all made my new car lease, as well as the trade in of my old vehicle, painless. The service team has serviced my older car and taken great care with it. I will definitely be taking my new MINI here in the future for all my maintenance. Michaelangelo and Zeke are the best! Thanks again for always taking good care of me and my X1. The team was very helpful, they did not act like sharks rather trying to help me with the right thing as a customer. I was surprised to see such a great attitude to help a customer compared to few other different brand car showrooms I have been to.